The Worcester-Bosch Greenstar 12Ri is a regular condensing boiler that is sufficiently compact and lightweight to be mounted on a kitchen wall in combination with a traditional domestic central heating pump and hot water storage cylinder etc.. 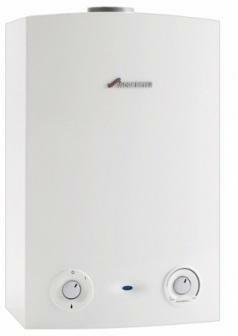 It is powerful enough to provide high efficiency central heating and hot water for a small house or flat. The appliance employs a robust and highly efficient heat exchanger constructed from cast aluminium and silicon which allows the latent heat in exhaust gases to be extracted for useful purposes rather than being lost through the boiler flue. Indeed the Worcester-Bosch Greenstar 12Ri is rated as highly efficient by SEDBUK 2009 (Seasonal Efficiency of Domestic Boilers in the United Kingdom) and is in band B for energy efficiency. The Greenstar 12Ri is 91% efficient in terms of fuel consumption in other words nearly 90% of the natural gas or LPG (Liquefied Petroleum Gas) burnt is converted into useful heat and can reduce heating bills by up to 35% in comparison to old non-condensing boilers.